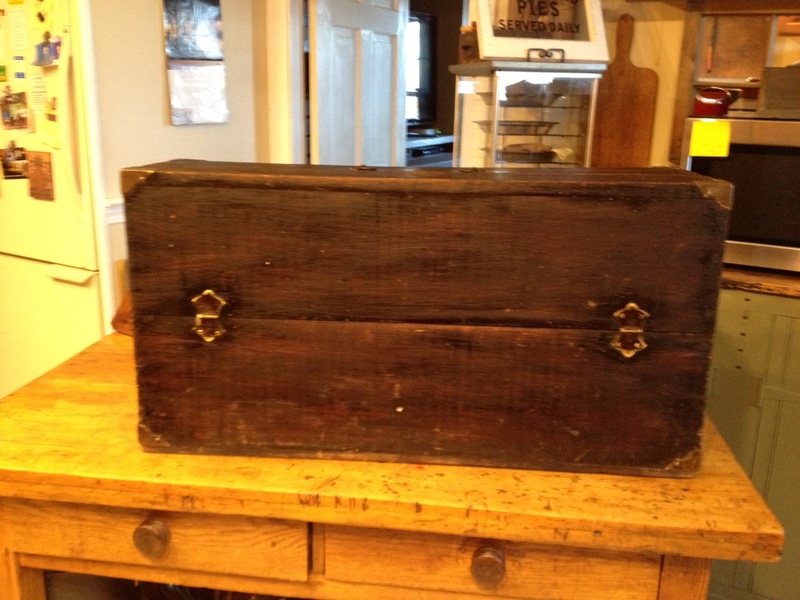 This old wooden toolbox is of my items currently on display at Covey House in Fitzwilliam, NH. Clare Rose-Howard has a beautiful shop right on the Common. It is classic New England. This container was originally an old toolbox. I love finding small chests and old wooden toolboxes. I know they were commonplace items used by common everyday laborers. When I was a little girl, I remember little boys often using their Dad’s hand tools. It was always a big deal for a boy to get his own kid-sized toolbox. These items have a story to tell, from a day when more men worked with their hands, than we see today. 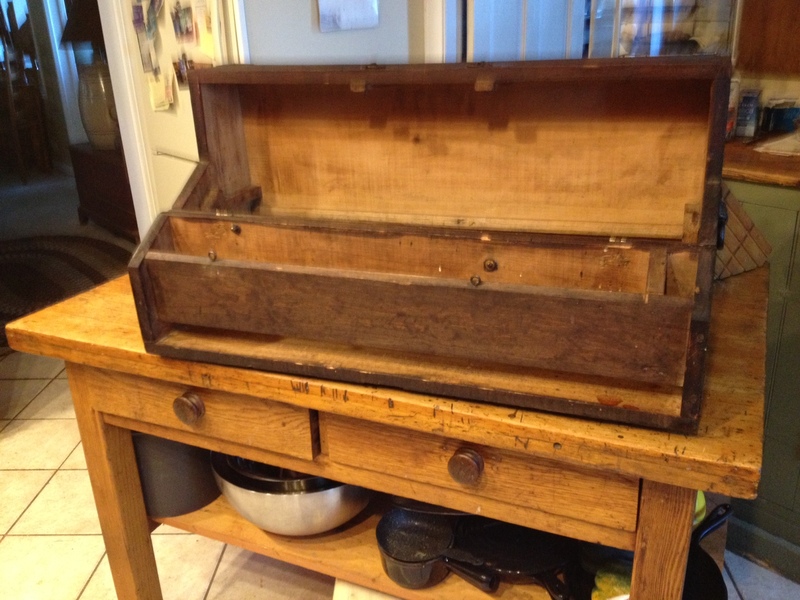 This photo shows the faded and dry condition of the wood, as it was when I found the toolbox. I came upon this toolbox on one of my weekly trips in New Hampshire. It was a very unusual toolbox. It clearly was designed for a very specific purpose. It is about 3 feet wide, a 18 inches high, and only about 10 inches deep. When you unhook the latches, if unfolds, revealing a couple narrow compartments. Each corner has a brass corner guard, the front hinges are brass, as well as the latches on top. There was a handle on the top in days gone by, but that has been lost. The sides have a couple iron handles for carrying the box. 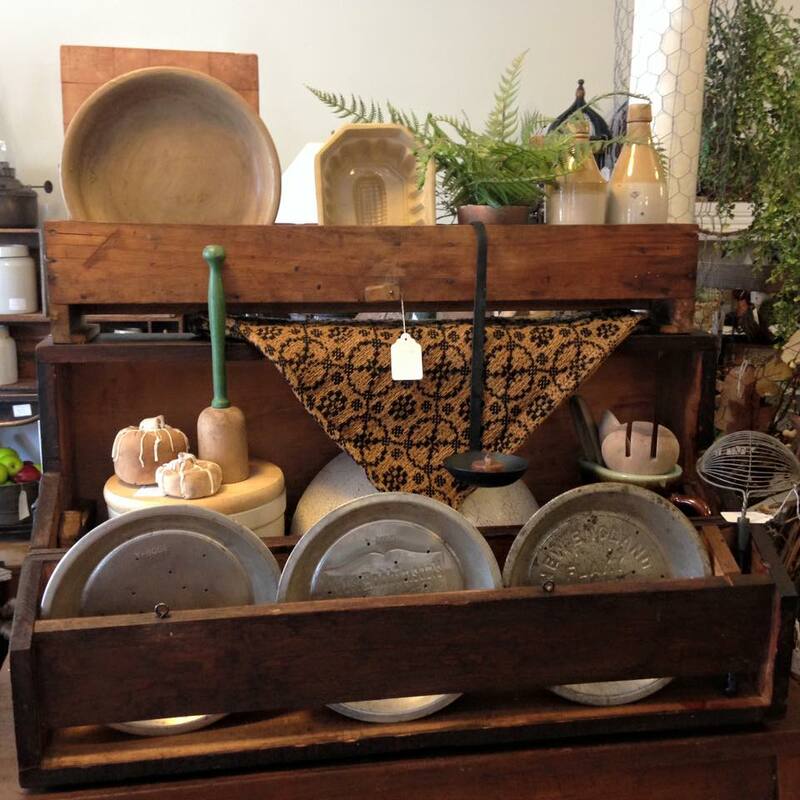 As soon as I saw it, I envisioned it as a centerpiece for displaying old kitchenware. So I snagged it. When I got it home, I sanded it and restored the finish, since the wood was very dry and faded. The wood looks nice with a little TLC. The finish is restored and the wood still maintains it’s old patina. By the time Charles arrived home that evening it was done, and already repurposed. Charles never got a chance to inspect it. He came home and it was full. He has never seen it empty, or folded up closed. If he had, he might have been able to tell me what it was designed for. With nothing to base his hunch on except the physical dimensions, he suspects it may have been used for handsaws. It always delights me to find ways to breathe new life into found objects, regardless of how far from its original purpose it may be. If you like this photo and story, please share it with your friends with any of the buttons below. Enter your email address to subscribe to this blog and receive notifications of new posts by email. No Spam, just essays. The New Suzanne's Cottage - Suzanne's Cottage on Too Much Stuff? What Can You Do?